It may be the world’s most versatile coating. It insulates, cools, waterproofs, and kills germs, and it blocks the sun and enables your sense of touch. But no one designed our skin. Instead, over millions of years, skin gradually changed to help humans — and the animals that came before us — adapt to the elements and thrive in an ever-changing world. Versatile surfaces abound in plants and animals, and they deliver extraordinary performance tailored to the job at hand. Geckos use Velcro-like structures on their feet to walk up walls. Carnivorous pitcher plants coat their flowers with a ridged, nectar-laden surface so slippery that insects slide inside to their doom. Tooth enamel lets us crack a walnut in our teeth and emerge with our smile intact. The strong adhesive nature of the gecko’s feet are known to have inspired superglue. 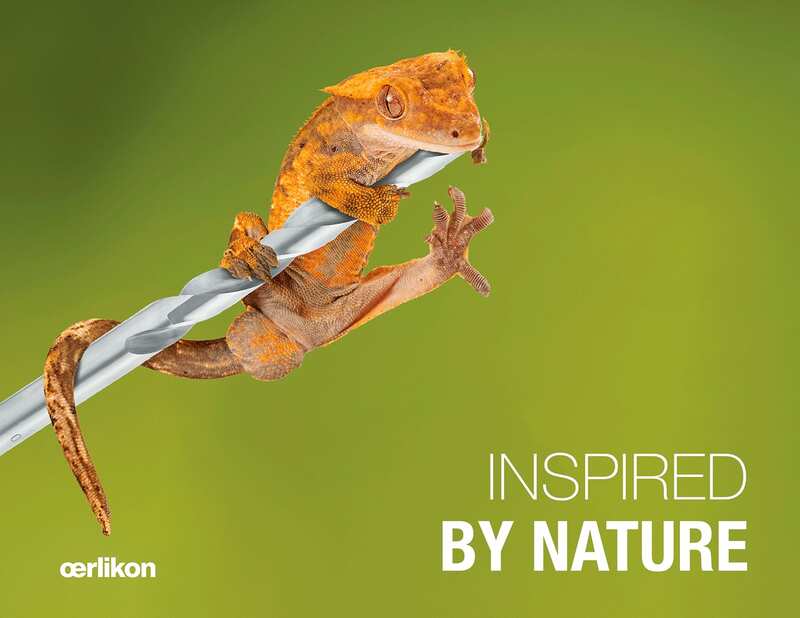 Borrowing this feature, coatings from Oerlikon are powerfully adhesive to metal surfaces, enabling tools to withstand extremely high friction, pressure, usage and heat. The sea turtle’s hard shell protects it from predators and yet has the right amount of friction for it to swim and maneuver quickly underwater. Mimicking this, Oerlikon coatings also protect turbines used in hydropower generation from wear and erosion, enabling the blades to effectively rotate and optimize energy production. 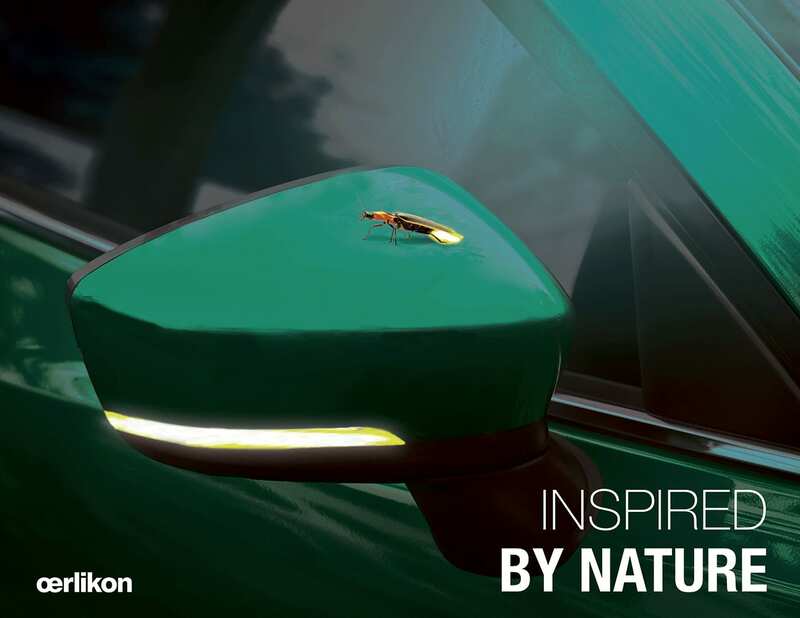 Side view mirrors can be metallically coated with Oerlikon Balzers’ ePD solution, shielding the mirror’s turn signal during the day while enabling its safety functionality at night, just as a firefly glows as a warning signal. Click on the red arrow to see what’s behind the pictures. “Interactions at the surface control life,” says Alex Dommann, Ph.D., a materials scientist who heads the ‘Materials meet Life’ department at EMPA, the Swiss Federal Laboratories for Materials Science and Technology, in St. Gallen, Switzerland. 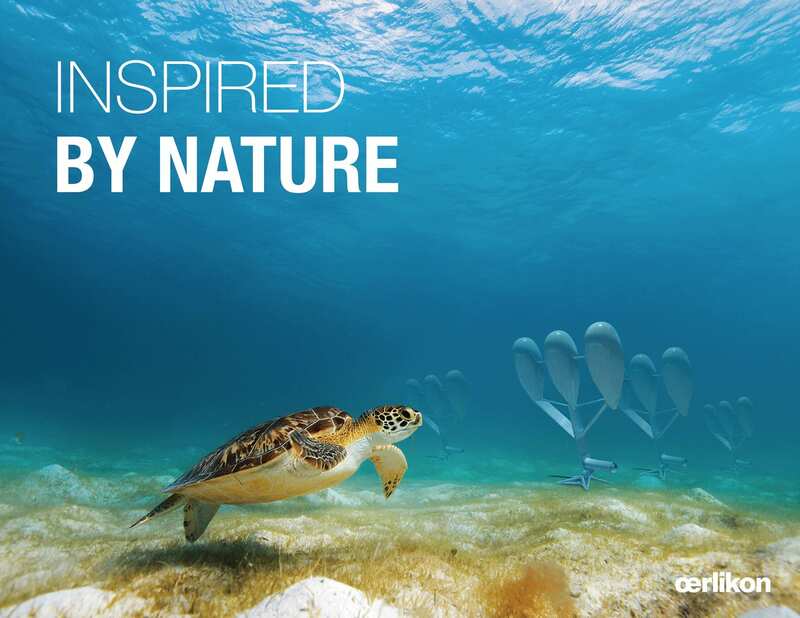 And nature’s strategies, he says, can inspire new surface technologies beyond any yet invented. Special coatings can make materials last longer, perform more effectively, or simply look better. Such properties are so essential that an entire discipline of surface engineering now provides critical support for the aerospace, automotive, construction, power generation and biomedical industries. In designing new surfaces, “nature already teaches us a lot of lessons,” Dommann says. Surfaces in nature can help the tissue underneath — and the organism — function well in an extreme environment. Desert plants survive long periods of extreme aridity with the help of waxy surfaces and adjustable pores that control how much water escapes into the air. Similarly, turbines in power plants work most efficiently around hot gas at high pressure. But if it gets too hot for too long, their blades, which are made from superalloys, can react with oxygen, corrode and fail. A protective coating that survives blast-furnace conditions[i] keeps oxygen from diffusing in and corroding the turbine blades. This enables the turbine to last longer and work better. “Coatings offer the possibility of changing how a material interacts with its environment,” Dommann says. In some cases, surfaces can be designed through biomimicry — by imitating the molecular strategies that animals and plants employ. If you wanted to make a coating that repels water, you could investigate the lotus plant, says Helmut Rudigier, the chief technology officer of Oerlikon Surface Solutions Segment. Studying how plants control gas flow into a leaf could help scientists design new types of coatings that restrict the diffusion of gases, Dommann adds. Most often, however, studying nature reveals strategies that materials scientists can pursue to develop new coatings. Synthetic surface coatings, unlike human skin, have traditionally offered one function and one function only. “But in nature a coating has a lot of different functionalities at the same time,” Dommann says. Scientists are getting better at packing multiple functions into a single surface solution. “Gear surfaces in a racecar’s gearbox, for example, should be hard to enable them to transfer force efficiently and with the required durability. Building them with tungsten carbide takes care of that. But they should also slide off one another easily to reduce friction and transfer maximal power to the drivetrain. Tribological coatings — coatings that reduce friction — help. To make gears slip, engineers layer in graphite, a softer, more slippery material, into the gear’s surface coating. The result is a stable but low-friction gearbox that’s used in Formula 1 cars. Nature’s surfaces can often adapt to changing circumstances, making almost every coating on plants or animals a smart coating. If you get a scratch on your skin, your body activates wound-healing processes to close up the scratch and replace the damaged tissue. Industrial surface solutions traditionally have not been so adaptable, but look for them to catch up in the years to come, Dommann says. Already under development are bandages with fibers made by Oerlikon that change color if the wound they’re protecting is infected. Also possible are adaptive airplane wings that shapeshift and become rougher to create the drag needed during takeoff. The pilot would no longer have to adjust flaps and winglets to get the plane off the ground, and the wings would adjust during flight to become smoother and aerodynamic. Smarter surfaces will require less material, reduce power consumption, offer improved effectiveness, and reveal new fields of applications — all of which will help the coating business grow tremendously, Dommann says. For years, automakers have given plastic bumpers, radiator grills, and other flexible plastic parts a metallic shine by dipping them in an electrified bath containing chromium or nickel derivatives and other salts. But the chromium and nickel compounds from this process, called electroplating, contaminate wastewater, often causing ecologically damaging water pollution. An innovative metallizing technology developed by Oerlikon Balzers can help. Like natural surface solutions, the new coating method, called ePD™, adds new functions, works efficiently and avoids ecological damage. To apply the new coating, the plastic part is coated with a UV lacquer to eliminate surface defects. Afterwards, the PVD layer is applied inline before a UV-topcoat is finally applied to protect the system. The metallized plastic that results has the shine of chrome that customers love, but its surface is as transparent to infrared light or radar as a glass window is to sunlight. That means that sensors can be hidden below the metallized surface, such as a radar sensor beneath a bumper that measures how far away the car is from another car or a pedestrian, says Rudigier. Such sensors could prevent collisions and injuries, providing benefits that are far more than skin deep. [i] Typical temperature inside a gas turbine is about 2000 F. Blast furnaces run from 1600-2300 F (900-1300 C). [ii] Dommann; also see Goodman, S., et al., “The Future of Biologic Coatings for Orthopaedic Implants,” Biomaterials. 2013 Apr; 34(13): 3174–3183. http://www.ncbi.nlm.nih.gov/pmc/articles/PMC3582840/. Ready articles like this make so excited about the future and what things are possible. Love the examples of bio mimicry and the visuals are stunning! Our representative will contact you soon, thank you for your kind request! Very informative and interesting article. It showed how we are indebted to nature. The solutions for various problems have been solved without disturbing the ecological balance. Big Thums Up to the people who made it possible. Keep it up. Best wishes for the future.